On Broadway (1959), in movie houses (1961), and afterward on television, Lorraine Hansberry’s A Raisin in the Sun increasingly held Black audiences — as well as White — rapturously spellbound. As hasn’t been done since, the American landmark helped usher this nation into the civilized world. The August Wilson of her day, Hansberry’s phenomenally unprecedented success came by rendering the culturally specific completely universal in a story rich in immediacy to convey a saga of humanity. Dramatizing that Black folk, yes, are people, too, whose lives matter. Said social statement galvanized via artistic genius, crafting a masterpiece, indeed blueprinting how to structure a flawless script. Seamless, subtly immediate, so powerfully convincing it felt like real life. As well, her depiction of the Younger dispelled stereotypes with authentic portrayals seldom seen in an era accustomed to caricatures. Warring with and wounding one another — as families do — ultimately bonded and strengthened by love, they pull together against adversity and valiantly prevail. Hansberry thus made history. At 29, African America’s first winner of the still highly coveted New York’s Drama Critic’s Circle Award, launching celebrity she leveraged to fight for civil rights. Recalling that tumultuous era, Martin Luther King and Malcolm X were iconic on the front lines; Hansberry doesn’t readily come to mind. She had her shoulder to the wheel, though. She raised unadulterated hell at a White House summit, castigating President John F. Kennedy and Attorney General Robert F. Kennedy. Then, storming out, leaving with James Baldwin, Kenneth Clark, Harry Belafonte, Lena Horne and others, all of whom she realized were invited not to inform and influence racial policy but as figureheads whose participation would take the heat off a foot-dragging administration more interested in reelection than ensuring the equality it supposedly championed. Early on, hers was a courageously uncompromising spirit. She integrated a University of Wisconsin-Madison in 1949, becoming so politically active, a classmate, pioneering future television news luminary Bob Teague, called Hansberry “…the only girl I knew who could whip together a fresh picket sign with her own hands at a moment’s notice for any cause or occasion.” She left without graduating from New York City where she attended socially progressive institution The New School. She lived in Harlem and, continuing her activism, fought evictions by which slumlords routinely with or without reasonable cause tossed tenants and their belongings on the sidewalk. In 1951, she joined the staff of Paul Robeson’s Freedom newspaper working alongside W. E. B. DuBois. In addition to supplying articles and contributing commentary (supporting among other causes the Mau Mau revolt in Kenya), she pitched in as subscription clerk, receptionist, typist and editorial assistant. Next year, Hansberry attended a Uruguay peace conference, subbing for Paul Robeson who the U.S. Department of State denied travel rights. This put her on a Federal Bureau of Investigation watch list, which, still spying on her 10 years later, noted A Raisin in the Sun as containing “dangerous” Pan-Africanist themes. On January 15, 2018, Martin Luther King, Jr. Day, American Masters — Lorraine Hansberry: Sighted Eyes/Feeling Heart (PBS) premiered, looking in depth at the life of this enduring icon. Narrated by LaTanya Richardson Jackson, featuring the voice of Anika Noni Rose as Lorraine Hansberry — both have acted in A Raisin in the Sun — the program, of course, pays homage to her hallmark achievement, interviewing original cast members Sidney Poitier, Ruby Dee, and Louis Gossett, Jr. Importantly, it also documents the playwright and essayist’s lifelong commitment to fighting injustice and how she embarked on theatre, emerging as a salient voice for civil rights at crucial time. There is, it goes without saying, no telling what monumental contributions she might’ve further made had she not succumbed to pancreatic cancer in 1965 at age 34. All the more important to honor her memory, celebrating what Lorraine Hansberry lived long enough to accomplish. 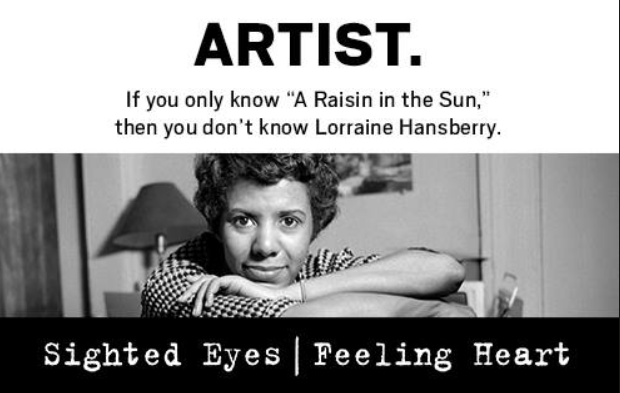 To see PBS’ Lorraine Hansberry: Sighted Eyes/Feeling Heart, go to http://bit.do/LorraineHansberryPBS. To see A Raisin in the Sun on the local stage, see Park Square Theatre’s production running from Feb. 22 to March 16. For more info, visit parksquaretheatre.org.